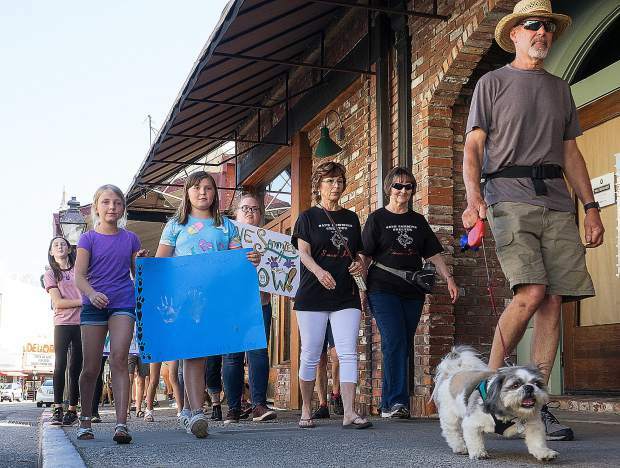 Friends of Sammie’s Friends walked from Mill Street to The Foothills Event Center on Idaho-Maryland Road Wednesday afternoon for the town hall meeting. Negotiations between Sammie’s Friends and Nevada County over a new animal shelter contract will begin Friday, a change that a cofounder of the animal group called a “pretty big development” from when she planned Wednesday’s town hall on the issue. Hundreds of people crowded into the Foothills Event Center erupted into applause as Cheryl Wicks, who with Curt Romander founded Sammie’s Friends, told them that Sheriff Keith Royal said he’d stop negotiations with Placer County and work with them. The current contract with Sammie’s Friends ends June 30. “So that’s a pretty big development since we planned this meeting,” Wicks said. The meeting, initially called when officials intended to outsource some adoption services to Placer County and have Nevada County staff operate the McCourtney Road facility, turned into a celebration in the wake of Royal’s decision. Shouts and applause punctuated Wicks’ speech several times as she thanked the community and detailed the services Sammie’s Friends provides. “I have never seen people work this hard and be this committed,” Wicks said. According to Wicks, her bid to operate the shelter called for $743,000 of county dollars. Sammie’s Friends, along with other sources, would provide more funds for a total of $1,147,000. Officials have yet to write a contract. The final cost is unknown. The decision on approving the contract rests with the Board of Supervisors. Several people praised Sammie’s Friends after Wicks spoke, including Romander, who called himself a silent partner. Romander said his group would keep the public informed as negotiations proceeded. “We will be open and honest,” he added. Mario Dinucci, a local veterinarian, said others in his field grow jealous when he describes the services Sammie’s Friends performs. “Most of these animals get the care they need and that’s really special,” Dinucci said. Wesley Nicks, Placer County’s director of Environmental Health and Animal Services, said in an email he feels Nevada County has missed a chance for increased collaboration.